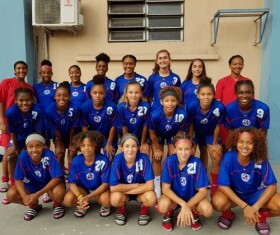 The Bermuda U-17 Women’s Football Team made an excellent showing by defeating Jamaica 3 – 2 in the CONCACAF Caribbean Under 17 Women’s Football Tournament in Haiti, which marks the first time our U-17 Women’s have beaten Jamaica and have made it to the semi-finals. Earlier in the week the Bermuda U-17 Women’s Team drew their first match against Trinidad and Tobago 2-2. They now await the outcome of the other group matches to determine if they advance to the final or contest for third place.